Exploring further the gifts of nature and in regard to my organic jewelery series, for this project I ventured into the magnificent family of Phellodendron or more commonly known as the cork tree. 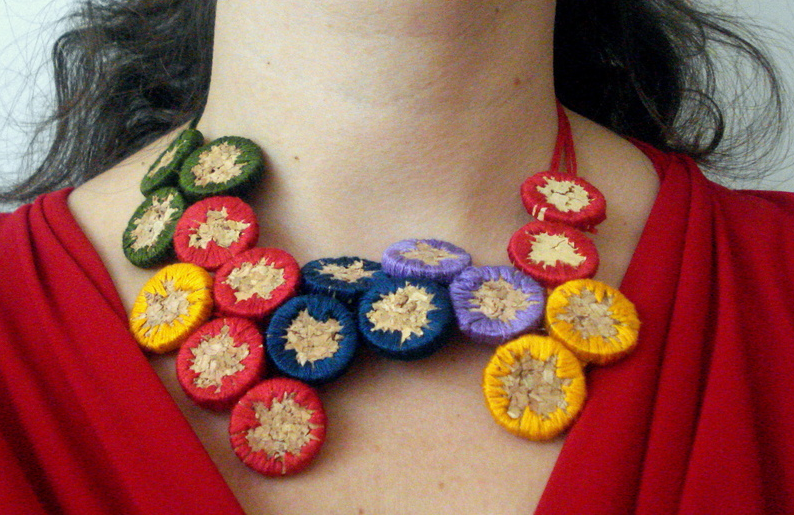 For this necklace I sliced the cork and used different embroidery thread to embellish the surface. Don't they look like small crocheted granny circles? Although its construction was quite exhaustive, time consuming and painful (my fingers still ache), it was really worth making. Along with my Melon necklaces this is the second, most favourite piece. I can even wear it as a bracelet. I would like to thank Mr. Thimble who proved quite a helpful assistant in my persistent efforts to conquer the cork and make it succumb to the will of my embroidery needle. I would also like to thank Mrs. Needle who acted strangely sometimes and faltered on the way through, but was strong enough not to break during the process. You don't think I could've stopped myself making just this one?! Yesterday I got back from a three-day trip to find out, delightedly, that the husband and the kids did not burn down the house, that they managed to keep it clean and tidy (!surprise, surprise!) and even make a presentable reception and entertainment for Eva's guest. Nevertheless, I am resuming my motherly duties as of immediately, so I'll just say "Have a nice weekend" and "I'll be writing to you soon". Don't worry. I didn't pluck off the peacocks. I collected the feathers from the ground. 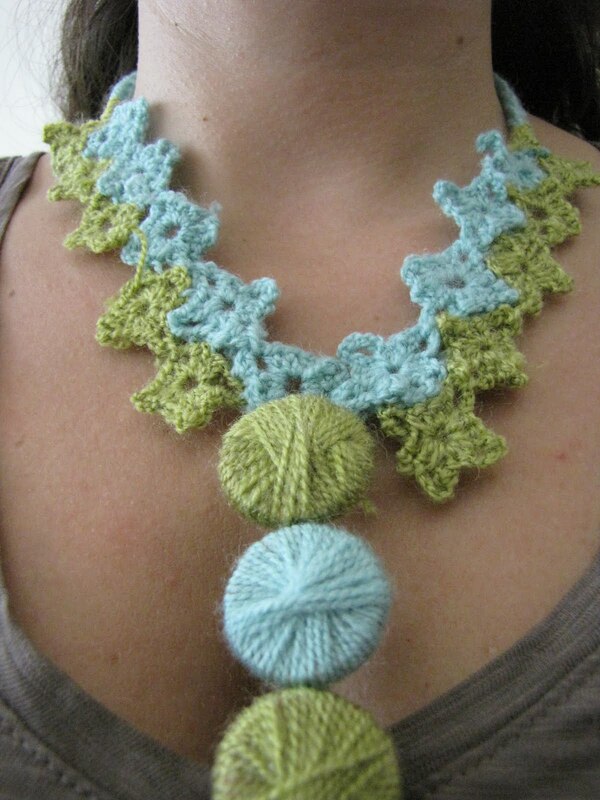 I love the combination of these two colours - they are the perfect match. 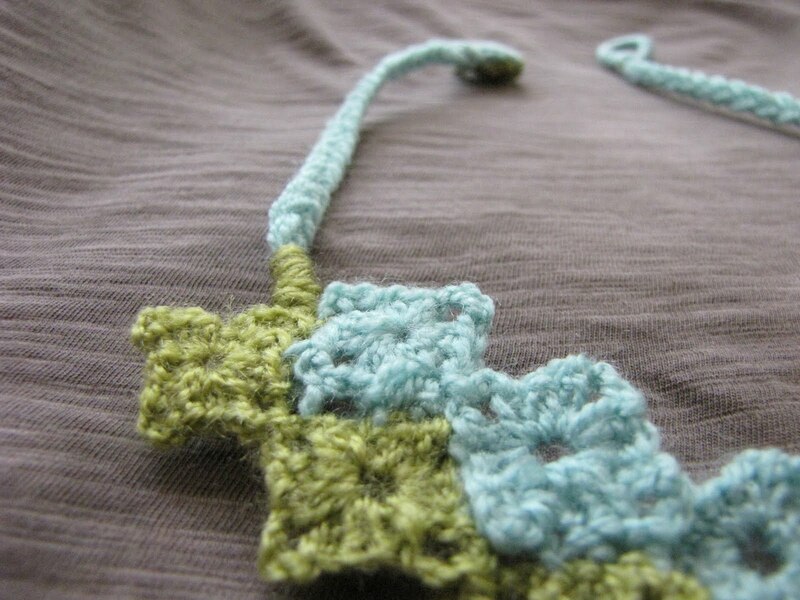 The two rows of crocheted flowers are joined together to create my new favourite accessory. Corks took over the part of dangling buttons. The closure. I love it. The green one is a little contorted due to the joining stitch but I really don't mind. My creative space is invaded by words in electronic form. Just a glimpse of what I was working on. The necklace is ready, but has to be photographed. 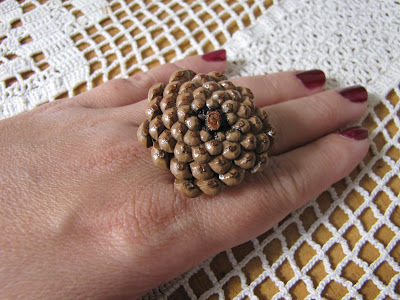 Continuing the series of organic jewelery, this is what I made with fir cones. 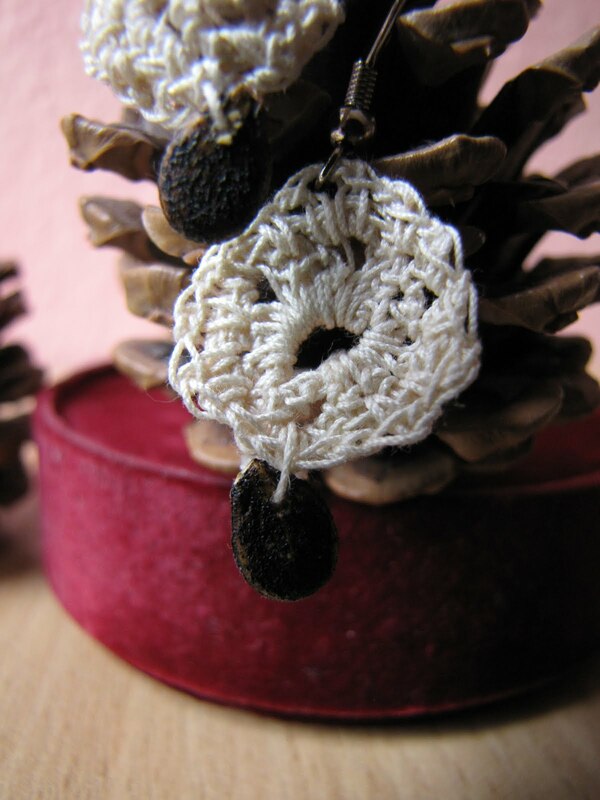 A lovely brooch. 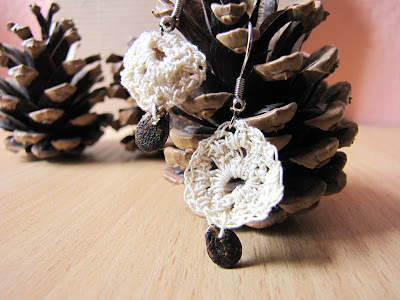 I had plenty of fir cones that we gathered last year and which I used to decorate my home. Working with them was a real challenge because they were pretty tough. I cut the upper part down to the last layers, smoothed its inner surface. I painted the surface of the one for the brooch, but left the one for the ring plain because I liked its natural appearance. Must say I am completely equipped with accessories for this fall. Still there's more coming up! The continuation of my series of organic jewelery is with the lovely watermelon earrings and necklace. 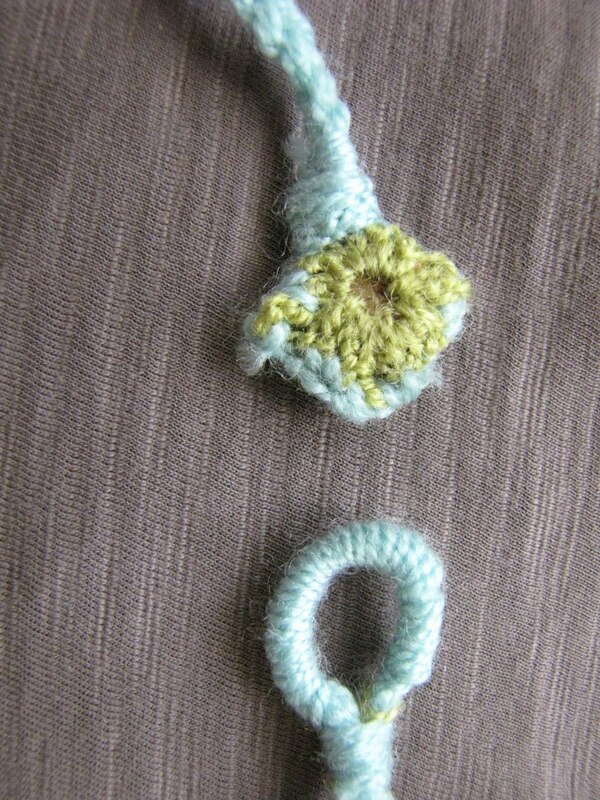 The crocheted earrings are quite tiny. 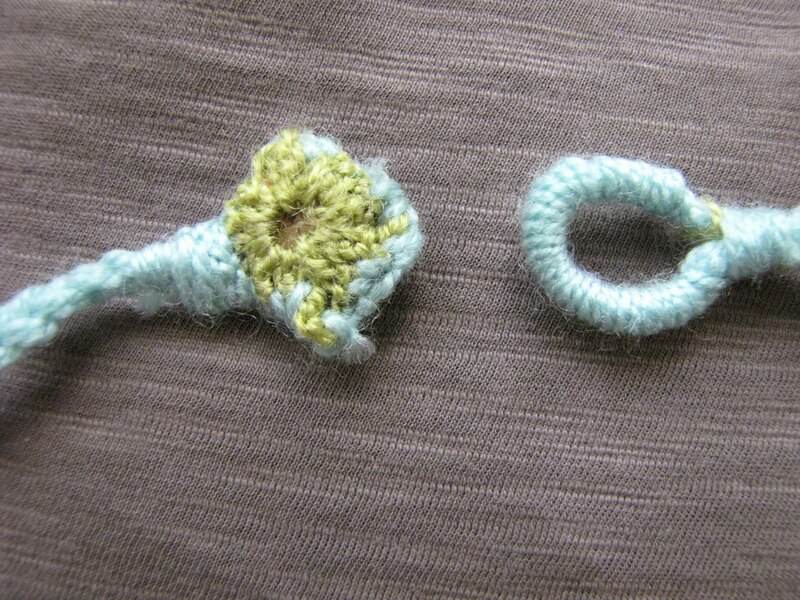 While crocheting them I thought my eyes are going to run out! However, it was worth it because I love how they turned out so delicate and sophisticated! It will be a real pleasure to wear these cuties! Watermelon seeds come in such different hues of brown and black it is really amazing. 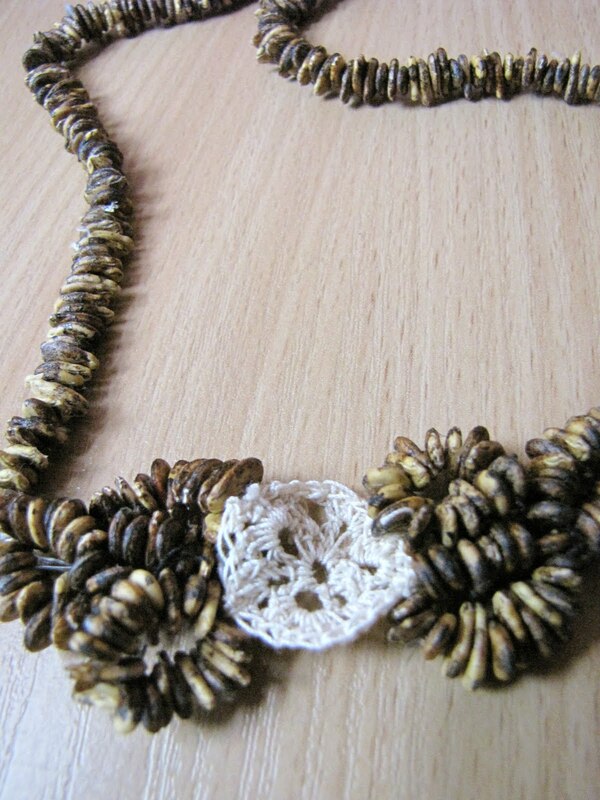 For my necklace I had sparkled brownish/beige seeds. I never paint watermelon seeds because nature has taken care of that itself. 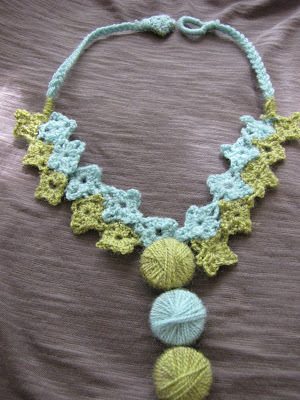 This is the necklace with a crocheted detail. Stay tuned until tomorrow. The series continues! I have always been inspired by the lavish, ever-inspiring nature and its incredible power of taking care of its loved ones. In every sense of the word. Whether it regards providing food, clothes or decoration. 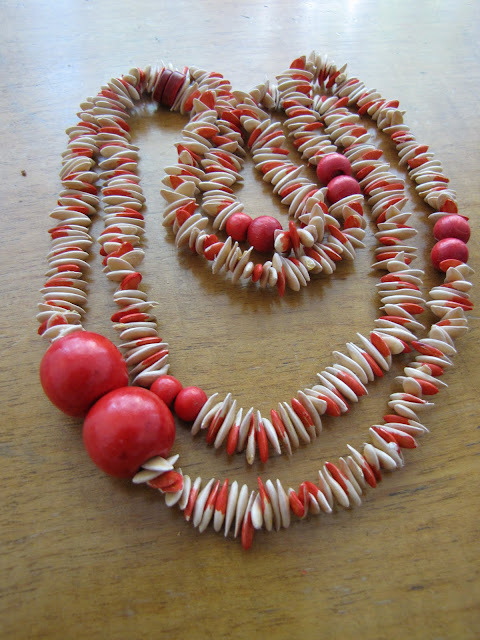 If you want to make a necklace or something else, scoop the seeds with a spoon and wash them in warm water with mild washing detergent to take off the slimy fibers. Then, let them sun/air dry. I usually put them onto a cotton napkin so they wouldn't stick to it. It is great if the seeds are big because they are easier for manipulation. 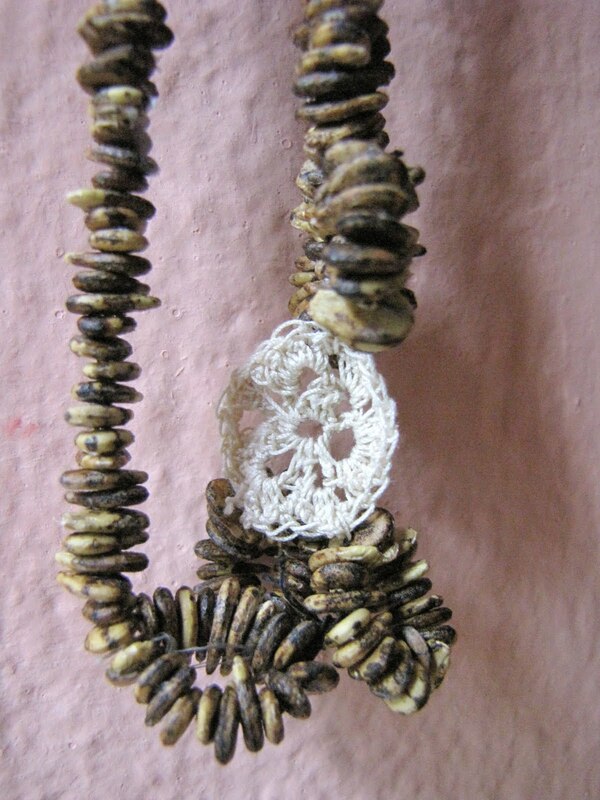 When piercing the seeds it is best if you do that in the middle. 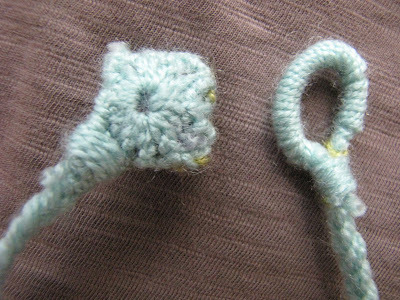 If you make a hole near the edges the seed might easily split. 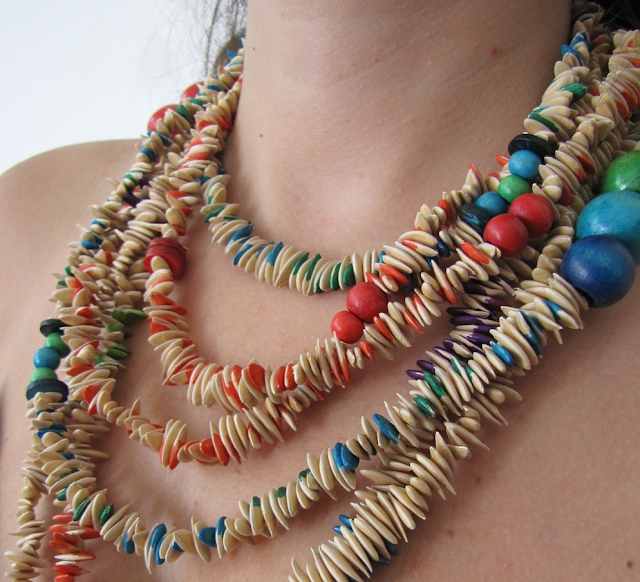 Choose your favourite colours, string the seeds and make yourself some organic jewelery! 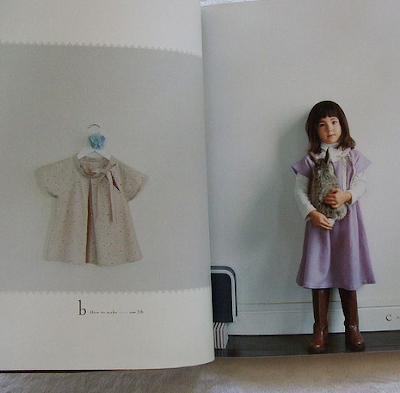 I never get bored by these genuinely inspiring magazines. 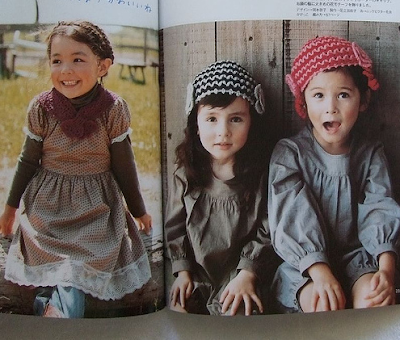 Whether it's Cotton friend, Pochee or Pattern book. Today I bought lace to make myself a dress inspired by these. I am going to draft the pattern and hopefully have it ready next week. No, you are not looking at lollipops. 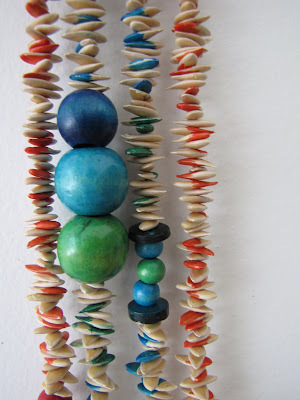 These are the beads I made for a necklace. Today is their lucky day since they've been in a box for more than a year now (even I can't believe that!) waiting to be finished. Today I can't concentrate on translating to save my life and I decided to make short interludes during which these babies are going to be polished.